A luxurious, intimate, modern, boutique hotel in Jersey, ideally situated in St Helier. When you stay at the Savoy Jersey we have all of your needs taken care of. Within the hotel we have numerous in house facilities that make your stay convenient and stress free. When you book your reservation directly with the hotel you will receive complimentary parking. On those warmer days you’ll have access to our outdoor pool area. Open from 1st April until 1st October it's the perfect tranquil setting for you to lie back and relax making the most of the Jersey sunshine. Our in door bespoke gym offers Life Fitness Hammer Strength Series machines, free weights and equipment to help keep you in shape. The gym is open from 7am to 9pm, allowing you to train at a time that is convenient for you. Our corporate customers have access to the lowest rates available. We take care of your corporate requirements so that you and your company enjoy all the benefits of being a Savoy Jersey corporate customer. 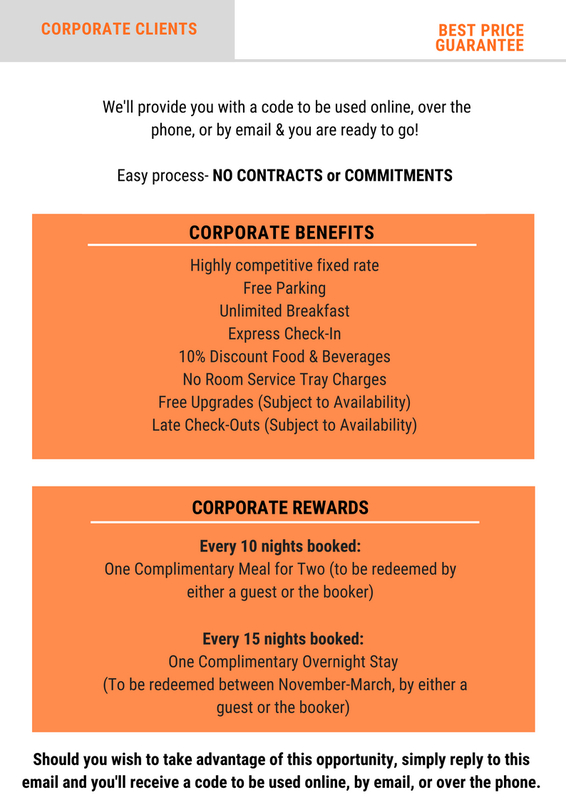 When you become a corporate customer we promise to offer you the best available rate at the time of booking. As a corporate customer you will receive a code for your company so you, your contractors, customers or guests can book quickly and easily through our reservations portal.